Martin shows his newest works in three series. Despite their wide range from monumental installation up to small paper collages, they are in no way inferior to themselves, oddly culminating an imbalance that rounds off the exhibition. 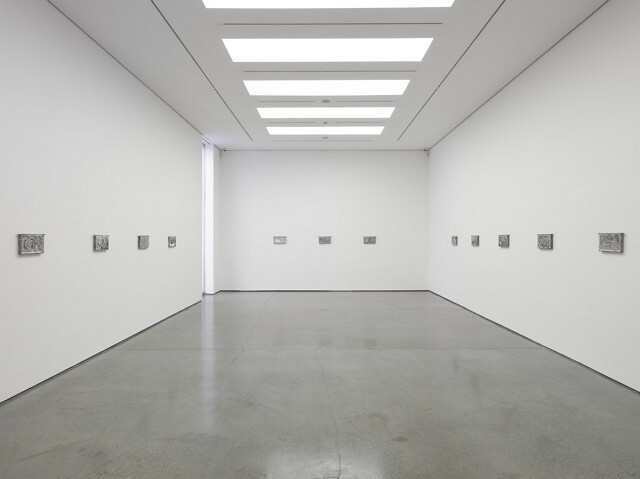 On the gallery's ground floor 18 works comprise the series Lost Wax. 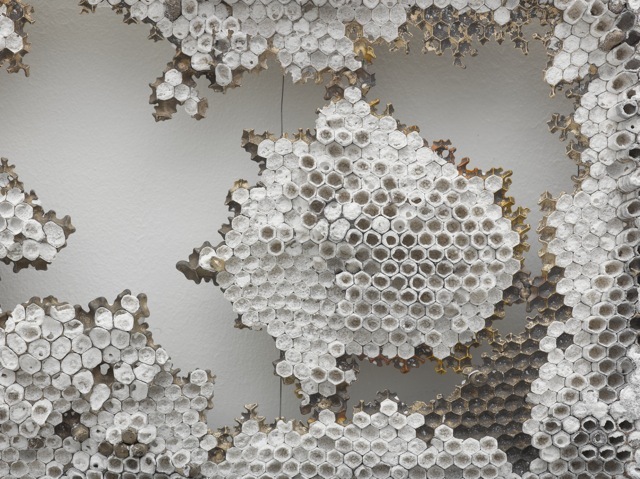 With an extremely elaborate, ancient technique, Martin casted the emptied cells of honeycombs in bronze and ceramic, in order to hang those (now perhaps eternally solidified) transformations of formerly moving and temporary structures as artificial objects on the gallery's wall. 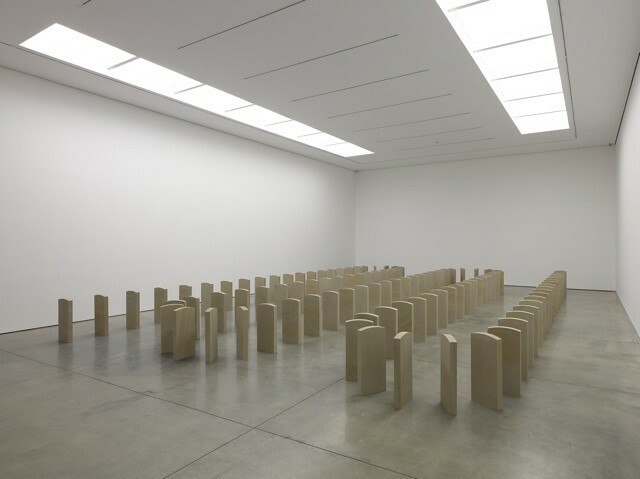 Untitled, the exhibition's second sculptural series on the lower ground floor, is a huge installation consisting of 104 sandstone blocks. The circa one metre high blocks are shaped like gravestones, however, bearing no inscriptions and thus appearing quite alien. Assembled like a chain of dominos, they are positioned in a long serpentine, literally inviting to be pushed, in order to be dashed to the ground. 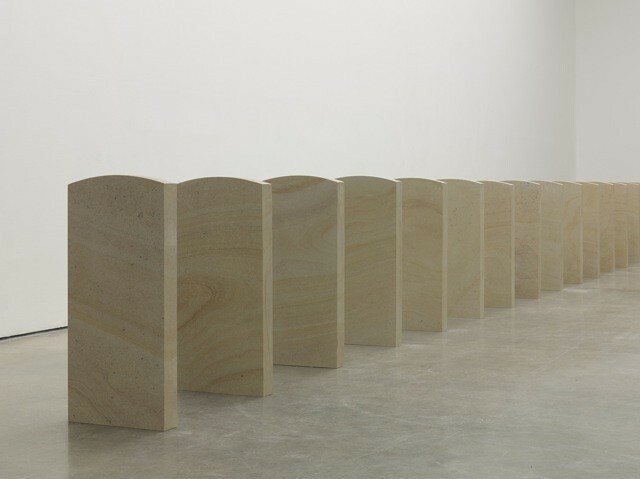 Humorously and subtly, this work draws attention to issues concerning fate, accident, death, and downfall, which becomes more drastic when transferring the domino principle, for example, to social processes, wars, or political upheavals. 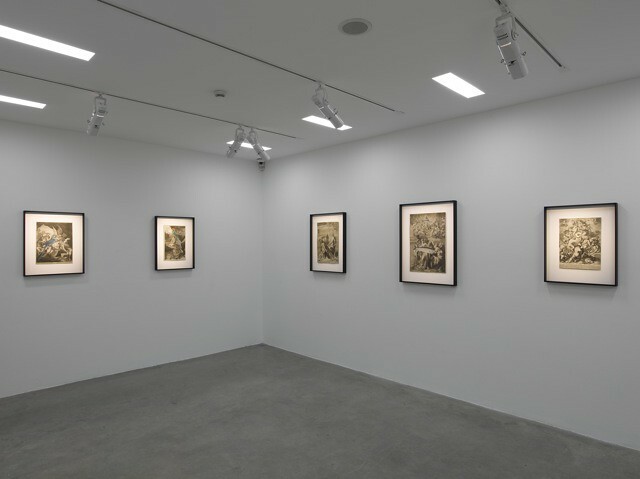 The third part of the exhibition functions as a counterpoint to the sculptural series of work: Six paper collages, which Kris Martin composed of original 17th and 18th century etchings, by pasting hand-coloured zoology and botany prints into etchings displaying Christian or mythological content. The visual outcome is, for instance, a colourful parrot that has alighted on the leg of God’s Son during an entombment of Christ scene, or Saint Peter, who is half-covered by a huge monkfish, while kneeling in front of Jesus at the Sea of Galilee. With his way of working, namely the transformation, modification and re-arrangement of found material, Martin succeeds also in many others of his works, creating new levels of meaning and narrative structures completely alienated from the original context. 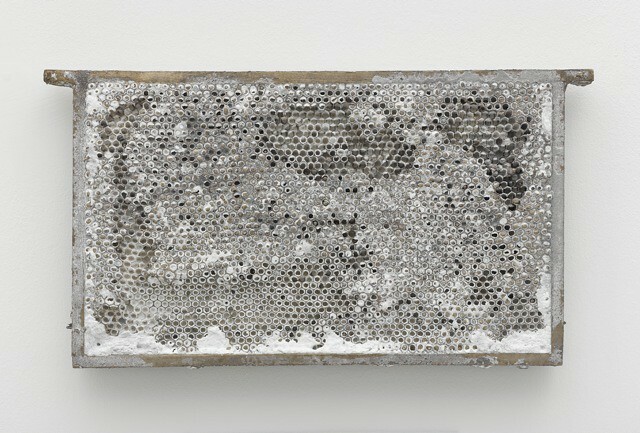 Big themes, such as religion, destiny, transience and continuity are characteristic for his work and so is the re-contextualisation and re-shaping of found everyday objects. Generally, he seems to love entering the existential questions of life, death, history, and time. Materialising these questions with a large spectrum, reaching from monumental objects up to miniature sculptures and drawings, he is able to transport them snappily, while a dose of irony and sarcasm is never absent. Martin is not giving answers, he simply creates new spaces for thoughts. His works tell stories, the materiality demonstrates age, immanent time, feelings and ideas, which he just reveals and then leaves it to the spectator to reflect, to question, to contemplate. 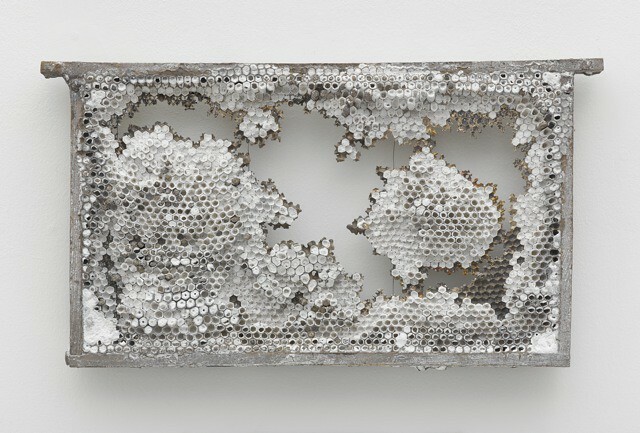 Martin stays true to his principles and succeeds again in surprising the viewer with each new work and each new show.